A few weeks ago, Kabul's Bagh-e-Babar, the resting place of the first Mughal emperor, hosted a sumptuous lunch. The invitees were the workmen on the site as well as the neighbours, residents of the adjoining hill. Sheep were slaughtered in the ritual manner, and kabab and pulau were feasted on. It was a traditional thanksgiving in the best Afghan tradition, offered by an Uzbek businessman who traces his lineage to Emperor Zahiruddin Mohammad Babar. In a city bombed to smithereens, not a single historical monument remains intact, and restoration has to be only one of the many contending priorities in a country where people's very lives have been shattered. But the project for the restoration of the garden that Babar, a prince in exile, created for a sense of peace and belonging in a strange land is also one of the ways in which a war-ravaged city is now being restored to its people. Even before the completion of the project, the gates of the garden are open to the people of Kabul. Families and groups of friends are flocking in to rest and picnic in this tranquil green oasis. Only residents of a city picking out their lives amidst the rubble and dust of 30 years of war can understand the importance of this space. 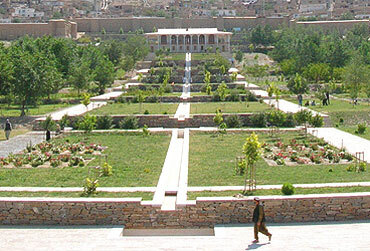 The garden, which is being restored by the Aga Khan Trust for Culture (AKTC), together with Afghanistan's ministry of culture, the Kabul municipality and UNESCO, has tried to resuscitate traditional crafts by using techniques employed in the original building as well as those used widely in rural Afghanistan even now, so that Afghan craftsmen do not forget their traditions, says Jolyon Leslie, program manager, AKTC. To train the workmen, the trust went back to some of the ancient building techniques still preserved in Iran and India, and several Afghan master-craftsmen received training in India where these skills are still alive. The same techniques have been used in the restoration of Humayun's Tomb in Delhi. When AKTC took charge of the Bagh-e-Babar, it was a wilderness of tangled weeds, mine holes and bomb craters. The site had formed part of the frontline in fierce battles for control of Kabul, and taken a heavy share of the hits. 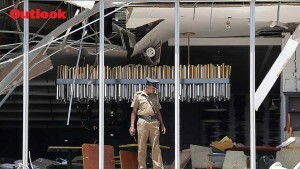 Work has had to proceed with care, with plenty of live ammunition extracted from the site. The Bagh-e-Babar began as a natural wilderness spread over 11 hectares. Always longing for Fergana, the small kingdom in present-day Uzbekistan that he lost when he was 13, Babar tried to recreate its beauty wherever he went, building gardens in different parts of his growing empire, and introducing new plants and fruits to the regions he conquered. Unlike the highly stylised gardens of the later Mughal rulers, Babar's gardens were more natural pieces of land reclaimed from the wilderness and transformed with some ordered plots, flowers, fruit trees, and watered by streams. His attention to detail in the creation of his gardens is recorded in his memoirs, the Babarnama. "It is necessary to make geometrical grass plots and plant some flowers with nice colours and scents around the edges of the grass," Babar notes. But his favourites always remained his gardens in and around Kabul, the kingdom he conquered in 1504. His memoirs describe how in his garden in Kabul he had "a spring surrounded by stonework into a ten by ten pool, such that the four sides would form benches overlooking the grove of Judas trees. When the trees blossom, no place in the world equals it". On his death in 1530, Babar was first buried in Agra until, at the urging of his Afghan wife Bibi Mubarika, Humayun brought the remains to his garden in Kabul, fulfilling Babar's wishes. In succeeding years, during visits to Kabul by later Mughal kings, including Shah Jahan, the Bagh-e-Babar became more structured and formal, with walls and water cascades added. More structures were built in subsequent years. The pavilion and the queen's palace were built by Amir Abdur Rahman Khan at the end of the 19th century but cut into the original design of the garden, including the central axis. The central water channel was disrupted. During the Soviet era, a swimming pool was built inside the garden as well as a greenhouse in an attempt to make it more of a public space. The garden suffered its worst blow in 1992-93 when bombing destroyed the water systems. Though these were restored in the mid-'90s, the original trees had died by then. While past archaeological surveys provided some information about the original garden, old foundations like that of the Shahjahani gate were discovered during the ongoing restoration, as was the central water channel. For the enclosure of Babar's grave, an 1852 drawing by Charles Mason which was found in the British Library was used to recreate the original. For this work, the marble was brought from India, and Indian craftsmen were used to create a replica, which was assembled in spring this year. Sixteen species of plants mentioned in the original Babarnama have been replanted in the Bagh-e-Babar—planes, apricot, apples, peaches, quince, pomegranate, hawthorn, cherry and argowan (judas) trees. Traditional Afghan building techniques, including the use of hand-laid earth (pakhsa) and sun-dried bricks on stone foundations, have been used, as have their methods of mixing lime and making load-bearing arches. But while tradition has been resurrected, the garden's restoration also reflects contemporary needs. The Shahjahani gate, for instance, will now become a public reception centre. The Soviet-era swimming pool, an eyesore in the original design, has been shifted just outside the perimeter and will provide valuable revenue for the garden. The queen's palace has been redeveloped—it has already hosted the performance of a Shakespeare play. As the Bagh-e-Babar regains its former glory, providing balm for the soul of this bruised and battered city, Babar can rest easy in his grave again.